Hugging and feeding a single child may not change the world, but it does make a forever change for the one who feels love and tastes a chance at a full life. What if we each could change a life? Can you imagine how your life would change if you knew that you saved the life of a child? How do you define yourself today? Look in the mirror and consider how you would see yourself if you knew that every month you were providing a home to an abandoned baby. 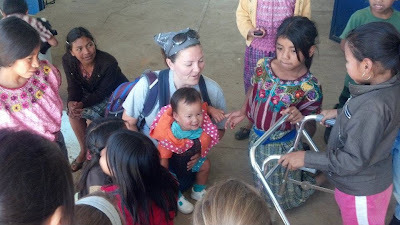 A trip to Guatemala changed my life forever. The adoption of our daughters from Russia and China has shown us the incredible potential that a single couple can have on the life of an abandoned child. We now dedicate our lives to bring these two experiences together to make an eternal difference. Adoption is a beautiful answer for the poverty and abandonment we have seen in Guatemala. We are moving to San Cristobal, Guatemala on June 13, 2013. We are resigning our jobs and stepping away from our careers. We want to take our education and our skills and donate our time and the rest of our lives to live out our belief and connect orphaned children with forever families. And yet... we know that we cannot do this alone. While we are the feet on the ground, we need a multitude of our friends, family, co-workers, and acquaintances to be on mission beside us. We need partners. We need you to be our missionary partner. You care enough that you have been following our story, and you have our sincere gratitude. Your encouragement has helped strengthen us to take powerful steps of faith. Will you partner with us financially so that we can find forever homes to abandoned infant girls? What amount will you promise to send our way each month? When can you start giving? We need funds now so that we can purchase a vehicle. A missionary family has one available for us that is perfect for our needs. It is a diesel powered, four wheel drive SUV. We have agreed to purchase it for $6,000. We have a house available for us to rent, and we will need to begin paying for it after the first of the year. We will have moving expenses, airfare, and fees. infants that you have rescued. Contributions that we begin to receive now are vital! We also understand that some would like to start giving once we are actually there... and if that is you, we need to know how much you want to give, and when we can plan for it in our budget. Monthly contributions are the heartbeat of our mission. We need to be able to budget for basics and if you know that you are part of this incredible passion... we need to hear from you now. You can also call me directly at 513-292-1521. If you are already giving to a missionary, or relief organization... we ask that you continue providing support to those who depend on your faithfulness.